Welcome to That Hit the Spot! 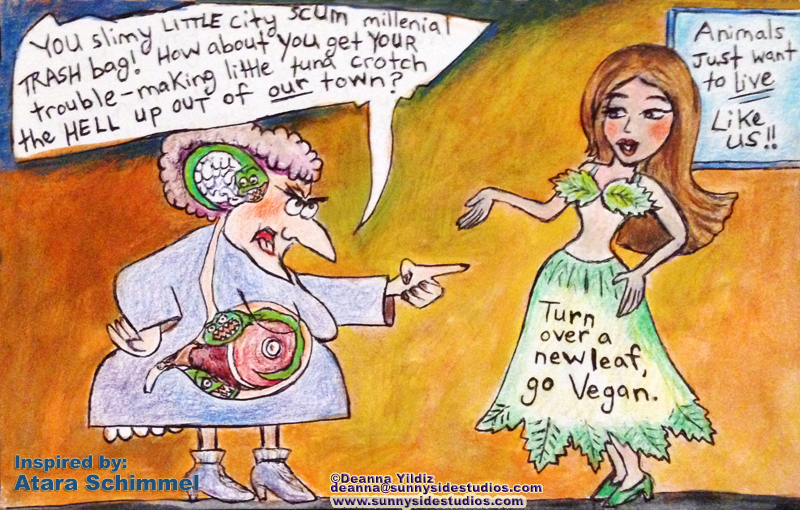 My Vegan Art Cartoon - "The Parasitic Brain!" "Here's a cartoon I made about the poor parasitic-infected animal-eating brains who say disturbing things out there. This one was inspired by a comment made to vegan advocate Atara Schimmel because she chooses to inspire others to be kind and not cruel to animals by eating them. I hope you can laugh at it. Turning a horrifying comment into some humor." In 2016, according to Atara Schimmel: "Performing my poem on factory 'farming' at the poetry slam at the Cantab Lounge in Boston. This is a revised version of the poem for which I was banned from the open mike at the Mews in Provincetown." Deahnara has humorous poems about snoring, the evils of "niceness", the disgusting feeling of unrequited love, love being returned in ecstasy, and many other poems - including dissection, cloning animals, Timothy McVeigh and more. Each time she writes, she focuses in on each varied topic with humor, depth and novel, fresh ideas. Witty, wise and charming! Here you can read a review on Farley's book and movie, "Never Cry Wolf." His books are amazing. He writes about the Innuit Eskimoes, and the wildlife in the Arctic North. He gives history and new information. He's a Canadian icon who's inspired many people and countries about the importance of preserving the wild world around us and respecting other's customs - even animal life! His books are a must read for every nature enthusiast. Uplifting Quotes, Poems and bits of advice. Cleverly said and worth remembering. If you need inspiration, you will find it here! This page was changed on June 26, 2016.